Councilman Alex Mendez, who touted his business credentials while running for office in the past and received endorsements for his business acumen less than 24 hours ago, owes thousands of dollars in judgments, according to court documents. The $9,824.24 judgment against Say Investment Holding in favor of the New Jersey Department of Labor was entered on Jan. 5, 2011 while the $4,537.74 judgment against Liberty Transport Group in favor of the New Jersey Department of Treasury was entered on Feb. 19, 2015. Both judgments remain open. Mendez was provided a list of the judgments for an explanation on Saturday morning. He neither responded to a message nor a call for comment. Mendez has publicly said he owns a “transportation company” without mentioning the name of the business. His company, Say Investment Holdings, began doing business as Josie’s Limousine Service, on May 16, 2007, according to state treasury records. Prior to that point, Josie’s Limousine Service, which was registered as a corporation in 2002, was owned by a Beatriz Sosa of Secaucus, according to state records. The corporation had the authority to issue 1,000 shares. Mendez’s involvement with the company is unclear. Mendez has refused to speak about his business record. For example, the Paterson Times asked him about his business three years ago, when he attempted to secure a high paying job with the city’s school district. “Those are my personal business,” Mendez said at the time even while, just months earlier, campaigning as being a successful business owner. Josie’s Limousine Service allegedly stiffed contractors out of money. In one case, Avi Taxi Repair of New York City billed $4,200 to Josie’s Limousine Service for “cars repair” on Sept. 11, 2007. Sosa made out a check for $3,040. When the taxi repair company attempted to cash the check, there was “insufficient” funds in the account, according to documents filed in court by Avi Taxi Repair. Avi Taxi Repair filed in court and received a $4,356 judgment against Josie’s Limousine Service. This judgment remains open. In another case, Josie’s Limousine Service allegedly stiffed a mobile service provider, out of $12,962.97. The company was unpaid for services provided from Nov. 2005 through Aug. 2006, according to court documents. Kevin Ucarian, owner of the mobile service provider, Remy Inc. of Secaucus, filed in court. He secured a $13,299.23 judgment against Josie’s Limousine Service. This judgment also remains open. Ucarian, who could not be reached for comments for this report, says in court filings, he hand delivered mobile services to Josie’s Limousine Service. Josie’s Limousine Service had its office at 1631 Paterson Plank Road in Secaucus while Ucarian’s office was at 1320 Paterson Plank Road – one mile apart. Mendez failed to make payments to Wells Fargo for money owed, according to court documents. He owed the bank $1,085.99 (including interest). In 2012, a debt collection agency, Security Credit Services, filed in court. The firm secured a $1,323 judgment against Mendez that remains open. Mendez’s financial struggles have become well-known as of late. For example, he has had a tough time paying his water and sewer bills. His family home on East 19th Street has liens for failure to pay sewer bills from 2013, according to Passaic County government records. However, his business record is not so well-known. He has publicly said he sold his limousine company suggesting it was a successful business. Mendez’s campaign bank account is managed the same way as his personal debt and business. His campaign issued 46 bounced checks to organizations and local merchants, according to campaign filings Mendez submitted to the state. 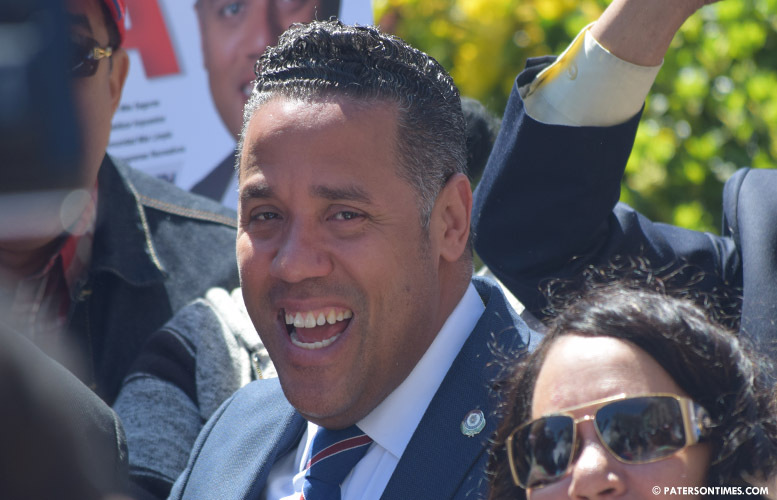 Mendez, who claimed to be the frontrunner in the six-person mayoral race less than 24 hours ago, has faced intense scrutiny. There is no credible poll that shows who is the frontrunner in the race. Some of the campaigns have conducted their own surveys. Each of these polls have the campaign’s candidate as the frontrunner. Some of his opponents reacted to the latest revelations. “In debates and everywhere he goes, he tends to highlight he’s a business owner. Now, using his skills as a business owner, he’s trying to be the mayor of Paterson. That’s not the kind of CEO Paterson needs,” said former school board member Pedro Rodriguez. Rodriguez said Mendez appears to live in a world that is far removed from reality. He said Mendez has been saying he sold the business, but it appears the company has gone belly up. Rodriguez’s campaign first uncovered some of the judgments against Mendez through an opposition research document, according to a source. Rodriguez would not openly say his campaign conducted the research. The research has been floating on the internet for weeks. Jackson has had his own business woes. He has said his business suffered due to the Great Recession. His business was closed for a while, but has re-opened. Other candidates running for mayor are councilman William McKoy and police officers’ union president Alex Cruz. Neither responded for comments. Mendez received two endorsements at the steps of the City Hall on Saturday afternoon. A member of one organization said Mendez “impressed” them for being a “businessman” with a commitment to serve others. I like how the rest of the scumbags are piling on. How much have they embezzled and stolen? Whoever gets elected. Will be indicted for corruption within a year. They're ALL crooks!